The legendary Gerry O'Brien celebrated 30 years as manager of The Churchill Arms, Kensington, last Sunday (12th July) with a street party for all his long serving customers, friends and family. There was even a special visit from Griffin and Pride, the Fuller’s dray horses! During his 30 year tenure at the Churchill Arms, Gerry has made his mark on the pub and it has become an icon in its own right, with customers coming to visit from all over the world. Gerry’s Irish charm is found in every nook and cranny of the pub. There are 42 hanging baskets, 48 window boxes, 100 tubs and a chimney pot that are filled to the brim with blossoming flowers, decorating the exterior of the pub. Inside, every inch of space is crammed with interesting items and bric-a-brac, his latest addition being a waterfall, including fish, in the conservatory. 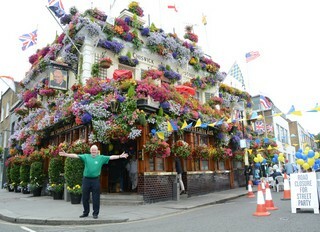 Gerry has served nearly two million pints of London Pride since coming to the Churchill Arms, and his attention to detail, love of beer and commitment to the Churchill Arms has seen him win many awards, including the Evening Standard Pub of the Year, London in Bloom and, most recently, was a top ten finalist in Visit Britain’s Tourism Superstar Awards. Whenever Gerry walks in behind the bar, everyone feels so uplifted. He has a natural flair to make people feel very special, which is why people from all over the world, travel to see him. He is a great entertainer, charismatic, and has a great presence. I would like to say the most enormous thank you to Gerry for looking after all his customers so passionately for the last 30 years. Pay Gerry a visit! Head over to the Churchill Arms website to find out more about this iconic London pub.